The Epson Stylus Colour SX200 is a multifunctional Epson printer that is well priced in the current printer market for the home and small business user. The Epson T0711 black ink cartridge is the ‘work-horse’ ink cartridge for this printer and will be replaced more frequently than any of the other colours. There are several good brands of compatible ink cartridges on the market that will work well with this printer. At a price tag of less than £80, this printer is good value for money and the savings you can make using a compatible ink cartridge can make the savings even greater. The Epson Stylus SX200 does not have the high-end features of its more expensive SX400 and so does not have a colour LCD screen but the selection of operational buttons make the printer surprisingly easy to use. Ink cartridges for the Epson Stylus Colour SX200 are available to buy singly or as a multipack. The multipack will offer all four colours but you will only need to insert one ink cartridge at a time, for example if you run out of the Cyan T0712 ink cartridge you can replace it on its own without having to replace all four colours at the same time. This printer is not the fastest of printers on the market from Epson. The text printed using compatible ink cartridges can be printed at approximately 13 pages per minute as an average, however if you run at this rate the quality may not be as good as you would prefer. It may be necessary to run the printer at a slower 4 pages per minute to get the best results. At under £80 the Stylus Colour SX200 ink cartridges will give excellent colour print results at a slower speed of 3 pages per minute with equally impressive results when using photo colour paper. The colour ink cartridges used with this printer are the T0712 Cyan ink cartridge; with a capacity of 13ml of ink. The T0713 Magenta ink cartridge has an ink volume of 13ml and the T0714 Yellow ink cartridge has the same ink volume of 13ml. 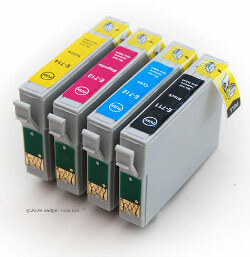 The compatible inkjet cartridges are by far the best buy for this printer and offer the least resistance when it comes to the ink cartridge being recognised. If there are any issues with the ink cartridge being recognized it can be remedied by a simple procedure. Firstly remove the USB cable from your printer – this is to break the link from the printer to the computer, then try reconnecting and see if this solves the problem. If not, secondly, switch the printer off and disconnect the USB lead and leave for 10 minutes, switch back on and reconnect the USB and see if this works. Compatible Ink Cartridges for the Epson Stylus Colour SX200 are such good value that it is worth persevering with any issues that arise with ink cartridge recognition.